KB over at The Fab Giver and co-founder of the Red Pump Project has yet another mission to put giving into action. 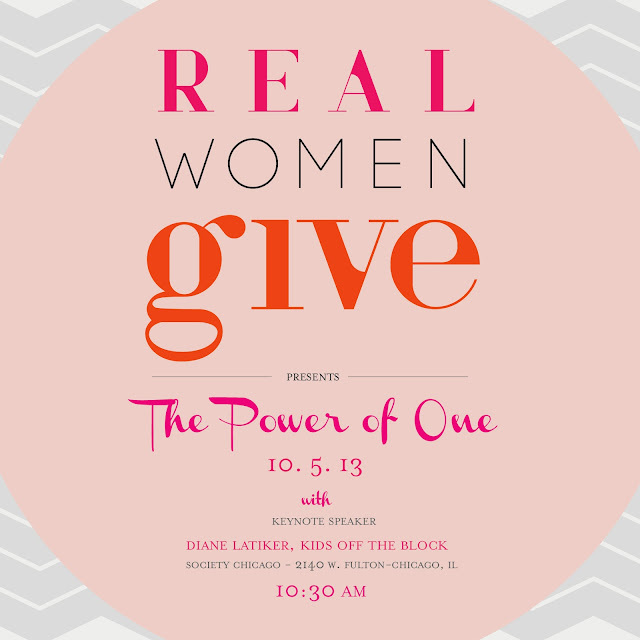 The Power of One breakfast will be a great kick-off to the Real Women Give initiative, and time well spent on a Saturday morning. Check out these details and get your tickets now!! "The Power of One" breakfast will be Saturday, October 5th, complete with delicious food, networking, and inspirational remarks from CNN Hero and Kids off the Block Founder, Diane Latiker. I have been moved and motivated by Diane’s story and commitment to building up young people in her community and across Chicago. She perfectly embodies what Real Women Give is all about. If you are unfamiliar with her, please check out this video. Tickets for the breakfast are $35 and are now on sale at http://realwomengivebreakfast.eventbrite.com. I hope that you will join me and others who give for what will be an amazing morning.